The earliest map of the area, 1769 Andrew, Drury and Herbert’s map of Kent shows that the area where the house is built being called Sedcomb. It was situated in the Bromley and Beckenham Hundred and the later 1778 map shows the area now called Sedcop. The land where the house is built was originally shrubbery adjoining an orchard (Plot 78 on the 1830 map), generally the area surrounding was wood, meadow, plantation and orchard. In 1830 plot 79 was owned by James Lowe Esq. The 1865 map now labels the plot as 61, it is part of the Footscray Manor Estate. The Plan of the Estate shows that plot 61 is called ‘Rushey Meadow’. The local Manor House was ‘Sidcup Place’ and the parish was Footscray. 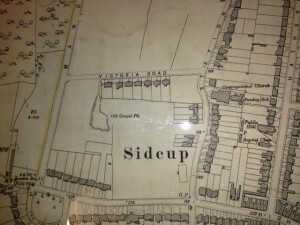 With the building of Sidcup Railway station in 1866 the area started to be developed and in the 1897 map the house is shown clearly as part of a development of 7 houses. The area was developed significantly over the next few years and the 1933 and 1939 maps show an area which is now fully developed with housing.